Can Olay Regenerist Really Help with the Anti-Aging Crusade? Does Olay Regenerist Really Work? The line-up of Olay Regenerist anti-aging products is pretty extensive, with treatments for different areas of the face, as well as those designed to treat unique problems. Olay is one of the larger brands of Proctor and Gamble and has been around for decades. One could make the argument that they couldn’t have become so successful without making quality products at fair prices. After taking into account the reviews for their different products, it’s clear that most people that try them, like them, and they continue to build on that success. But when they introduce a new product line meant to turn back the clock, many are still skeptical that they can pull it off. The biggest claim made for the Olay Regenerist line is that they can help you turn back the clock by making lines and wrinkles less noticeable. They have products for the eye areas, others that are meant for the jaw area, and still others that are meant to be used all over the face as an overall upkeep strategy. Their hope is that you won’t have to take “drastic measures” as they put it, which we can only assume they mean cosmetic surgery such as face lifts and other procedures to keep the wrinkles at bay. These products enjoy the hype that comes with a full nationwide television ad campaign, and this produces all the attention they’d ever need. They’re also available in local retail stores, so they have the advantage over products that are only available online. They also enjoy the brand recognition of Olay, and the benefit of having so many other Olay products go before them. Consumers now expect the latest and greatest in skin care when they think of Olay. The Olay Regenerist line has a range of prices depending on what item you get, from around $15 to about $30. They also have their Pro X facial brush which goes for $22. Anti-aging products typically come with a higher price tag due to the special ingredients they contain, and also because it’s considered something of a luxury item, with customers willing to spend the extra money in an attempt to keep their youthful looks. One thing that consumers might not like about the Regenerist line and the Olay brand in general is that they test on animals. This may be a way for them to keep their costs down, and you’ll have to decide for yourself whether this is a deal breaker or not. Using anti-aging products is something you’ll want to keep up with on a daily basis and incorporate into your morning and nightly routines. We have yet to find an anti-aging product where you use it once or twice and then get to keep the results indefinitely. When you join in on the fight against time you’re going to have to show up each day ready for a new battle. The commitment needed to use these products isn’t very high though, with many of them simply being rubbed into the skin much like a moisturizer or a foundation. Daily Regenerating Serum – It’s the amino–peptides and B3 vitamins in this that they claim help it to smooth out fine lines and wrinkles. It’s recommended that you add this to your daily routine and before you use moisturizers or make-up. It’s $15 for a 1.7oz bottle. Micro-Sculpting Cream – They compare this one to the luxury moisturizing creams costing hundreds of dollars and say that it works to improve the appearance of your jaw line and other areas that are prone to getting the sagging look. They’ve priced this around $20, in stark contrast to the luxury creams they compare it to. The Olay Regenerist line-up definitely shows some results, and makes a large majority of the people that try it happy with what they see. We’re giving the Thumbs Up to trying out their different products and it’s a good idea to browse through each of them before deciding on which ones you think would help you. It’s always good to be specific about what you’re trying to treat so that you can objectively measure the results you’re getting. We often recommend considering anti-aging products against doing nothing. If you sit idly by, gravity is going to have its way. Parts that you’re unhappy with already are likely to get worse, and parts that look good today will start to show signs of aging in the future. So you have to come up with a game plan on how to look your best for as long as you can. With so many positive reviews and a long track record of skin care success, we believe this warrants a try to see how well you respond to it. What do you think? 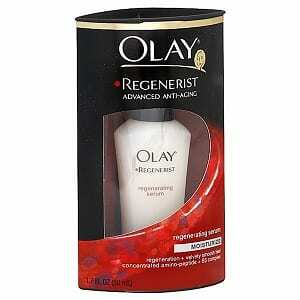 Does Olay Regenerist work or not? Does the LightStim Really Work? Does the Cupron Cosmetic Pillowcase Really Work? The thing about targeting different parts of the face with different creams is probably just a way to differential itself with other products and it’s probably a good marketing tool too, but regardless of the hype it does get a lot of positive reviews. It’s not like each bottle costs a hundred bucks, so yeah, I’m willing to give it a try. I’ve always enjoyed using Olay products because they really work. As I get older and the fine lines start forming I know that I need a great product. I saw the Regenerist product from Olay and purchased it immediately. It is affordable and an overall amazing product. I love the way that it instantly smooths my skin, leaving it feel soft and nourished. And, after just four days of using this product I could tell a major difference in the appearance of my skin. The lines were fading and my skin looked brighter and healthier. It is a wonderful product that I will continue using for a long time to come. When I head to the Anti- Aging products area of my local drugstore I generally reach for an Olay product FIRST. I always find some pretty great luck with their creams, exfoliators, and gels. Olay Regenerist is not exception. I would have to agree with the woman in the video; I can’t necessarily see the effects of the serum (maybe if I kept using it and looked at the results 15 years from now I would have a better idea…haha) but it does have a great consistency to act as a primer. For now, I think I will keep looking for another anti-aging product but this one isn’t necessarily bad.